There are some periods in life when words cannot be found to describe the feelings and the thoughts that come to you. The last nine months have been that kind of a time for me. On December 21, 2013, my father John S.D. Eisenhower died after 91 extraordinary years. Just weeks before his death, he finished his fourteenth book, American General: The Life and Times of William Tecumseh Sherman. On realizing that he would not be able to see the book through the editorial and production phase, he asked me – just days before his passing – if I would “complete” it. I was honored to step in and American General has now been published by NAL Caliber, a division of the Penguin Group. In the book’s foreword, I wrote that John Eisenhower had an “extraordinary ability to connect the intellectual dots across centuries of history and articulate them as simple principles, often associating them with the events of the day.” For me, this rare gift was inspiring. During this same time, my mother, Barbara Thompson Eisenhower Foltz, struggled with rapidly declining health. Much to our sorrow, our brave and eternally optimistic mother died recently on September 19. 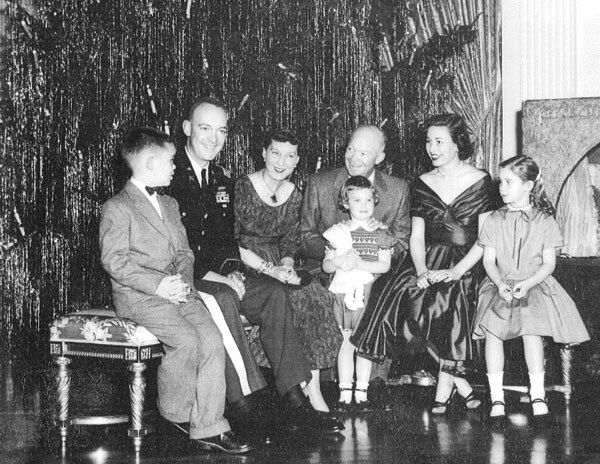 As the daughter-in-law of President Dwight D. Eisenhower, she was a hostess, a goodwill ambassador, and the mother of four inherently rambunctious (if well-trained) children. I am still amazed at how she managed, with virtually no help, to be a loving, unharried mother and a glamorous public figure. She set the gold standard. There was an additional passing that also touched my siblings and me. On September 14, only five days before our mother’s passing, Delores Moaney, our beloved housekeeper of 65 years, died at the remarkable age of 98. She, and Sgt. John Moaney who served as General Ike’s valet during the war, was with my grandparents from 1946 into their last years. Not long after, Delores came to live with me for a decade, helping me raise my three children as I juggled domestic life with a demanding full-time job. She remained an integral part of our family until the end of her life, forging all the while a continuing friendship between her grandchildren, great-grandchildren, and ours. How ironic, in a sense, that these three souls left us at the same time. They had been tireless servants of the public good during some of the most dangerous years of global history. They had lived a lot, experienced unforgettable things, and led productive lives. As the time drew near each, in his or her way, was ready to go. Still, we found it difficult to let them leave. In this we were not alone. As we mourn the loss of our loved ones, all of us feel the growing absence of their generation every day. Our elders are leaving us when so many of the values they championed—modesty, humility, and selflessness– seem to have disappeared from the scene. As John Eisenhower would have put it: the challenge is to find a way to meld the best traditions of the past with today’s world of change and transformation. And, there are reasons for hope. Common decency and service to others have not gone away. They live in parallel with the false heroes of a noisy, attention seeking and superficial culture. It is up to us to look for the exemplars of the world in which we want to live. The story of the last nine months has not only been sadness. The circle of life seemed complete when, on August 8, my newest grandchild was born. In holding her, it has been impossible not to think about my parents—or about the future and what might transpire in her lifetime. It has also been sobering to think that she will be looking to me for guidance, perspective, and an anchoring with the past. I feel this responsibility, too, with other members of the rising generations, especially as I begin another Strategy & Leadership (SALTT) seminar for undergraduate students at Gettysburg College. And so it is time to start my commentary again. I hope to share my thoughts on subjects that are central to our future, especially matters related to strategy and leadership. These discussions are at the heart of what will influence the country our young people inherit, just as they will determine our country’s place in the world. Still, I will write my regular offerings with pause and humility. I know my wiser counselors–those who knew me best– have gone. But they will always be a part of who I am and how I think. How this comes together, however, will be for the first time – mine alone. What beautiful words and what grand affirmation, love, and testimony you bring to honor these amazing people in your life. Wishing you much peace, resolution, and happiness as you move forward, changing the world, one commentary, one act of love, insight, and patriotism at a time. So glad to see you back in the saddle! A beautifully written message for all of us who feel a kinship to know of your extraordinary nine months. Life has a way of pausing us in just the right moments, prodding us with gentle reminders of our path. These are simply the reflections of who we are and where we’ve come from. My Grandmother was the most precious Soul I have ever met. That generation of wisdom, knowledge, LOVE and innocence, is practically gone and irreplaceable. Thank You for this very personal reflection and sharing. We have missed your wonderful perspectives. Wishing You and Yours Peace as you progress through the losses. Susan, both Nathan and I send our condolences. I want to say additionally that the heart of your essay – the passing of that generation – struck a real chord. I have been increasingly aware of late that the cast of characters in our lives has changed completely from the time of our youths until now. And that the qualities of that passed generation that were so endearing and so wonderful are endangered species today. You expressed those thoughts so meaningfully. Susan: I am sorry that you have endured so much loss in such a short time. As an admirer of your family and what they have given the country, I feel your loss and I have felt my own. I do hope that you find solace in your remembrances and in your children and grandchildren, as I have. I wish you peace and serenity and look forward to your future commentaries. There is not much I can add to the comments above- except my heartfelt condolences. I have missed your lovely writing. Susan–what an extraordinary tribute to your amazing family. These intimate and wise insights are a gift to your many friends and colleagues. It is so true that today’s cultural icons are no longer defined by “modesty, humility, and selflessness.” All the same, some of us continue to try and live according to these out-dated (even “counter-cultural”), but enduring, human values. We wouldn’t have it any other way. And your beautiful family tribute helps reaffirm and support this way of life. Susan, absolutely thrilled (for all of us) to appreciate you writing again with what was I felt to be the most deeply impassioned piece of yours I can remember, & justifiably so . Your incitefull honesty of “Mine Alone” reminded me of WWhitman quote about “Two greatest days of your life is day you are born, & the day you realize why”. You’ve clearly answered your calling in a most powerful way. Your reflections on past 10 mos. & the B&W family photo transported me to a kindler,gentler,& far safer time in the world & “Our town USA”(1966-67) when I delighted in walking the fairways, essentially risk free, w/Gen Ike & teaching David & Anne to swim at Gettysburg CC. without much in the way of SS intervention or intensity!! 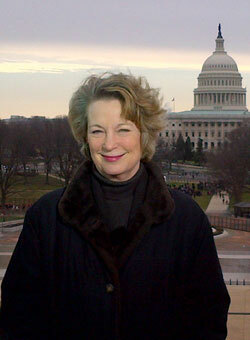 As a very proud & engaged alumnus(1968), Susan I sincerely thank you all your support & involvement in GbgCollege Eisenhower Institute and other college programs(SALTT), for prompting my all too brief interlude w/sanity, & for reminding yourself that so many of us can still learn so very much from you! Dear Susan: Alas, a bit late in the game in writing to you but know your friend here thinks of you more often than you might imagine. I have been on a similar trajectory in the last 13 months with different kinds of loss, but yet the same lingering sentiments. Your mother – that is a loss to waves and waves of people beyond those who knew and loved her the most intimately. I will never forget her warmth and trust and generosity. The most poignant observation is that you note the influence of all three on how you “think.” Too often I fear the world is unconscious of the forthright intention of thought – how it leads to forming feelings and moves one to action. But first thought must come and it can be trained with gentle but persistent self-discipline to help us move towards achieving our individual missions. Your parents and Delores will always remain alive because of how they guided your thinking and through those who’s thinking process you are already influencing. A post on Facebook led me search for my Ole chum, Barbara. You see, I met your mother in an English Literature class at Rosemont College. I was 20 and she was a wee bit older. We would often chat about course work but more often than not her usual question on a Friday afternoon would be “What are you doing tonight?” My usual reply would be “Barbara I’m going to Kelly’s. What about you, entertaining the Queen of England?” She’d laugh, that special laugh and out we’d go into our separate worlds. Our paths crossed at Rosemont over the years, attending an Alumni Function, where she introduced me to David and Julie, or sitting together at Sister George’s 50th anniversary mass. Although years had passed since our time together as English Majors we picked up where we left off….only this time I wasn’t headed to Kelly’s. Please accept my sincere condolences on the passing of your dear mother. She truly was gracious woman. After due consideration of the upcoming national election, I find that Hillary Clinton is nearer to being an Eisenhower Republican. Therefore, I have decided to vote for her instead of Mr. Trump. I find that Don is beginning to trouble me. I like the Platform of the Republican Party in 1956 and consider myself to be a Moderate Independent. I no longer believe that Mr. Trump has the ability to govern this country. I know from past experience that the Clintons do. Also, I understand your sadness. My wife, Nancy, only have each other now; however, I know that my parents are now in heaven (II Corinthians 5:1). May God bless you, Ms. Eisenhower. I worry about the future of the Republican Party. Gov. Pence would have made a good candidate for president; therefore, I wish he had received the nomination of the party of Lincoln, Roosevelt, Landon, and Eisenhower. That is why Senator John Warner and Governor Linwood Holton, who are good moderate Republicans in the tradition of Alf Landon, are supporting Mrs. Clinton. I do hope that Hillary will win. I have split my vote: for president I have voted for Clinton and for Congress I have supported the GOP. Its nice to hear what nice people my uncle John and aunt Delores work for , for so many years. It was a blessing for the both. Also so sorry for your lost. May the Lord be with you and bless you and your entire family. Dear Susan, remarkable words, have always enjoyed your unique perspectives of the world around you. As conscience beings with emotion that shape our characters we must live uniquely alone in our minds, shaping our world as we go up our life line. The loss of loved ones is especially painful, forcing us to draw upon ourselves and those we hold dear to us to counter the loss effect. However, uniquely, we can counter our loss through our positive memories of those who have moved on, make ourselves better by continuing positive practices and ethics. Wishing the best for you and your wonderful family.